Hello, Tux! Thank you for this new release! Recently I came back to playing some arcade games in Raine and have found a weird bug in KOF 96. After a certain part in the game, the emulator simply vanishes. Just after you read the character Kagura saying "I don't know. It's unbelievable!" in the cut scene demo, the emu will terminate. Interestingly if you cut the demo animation by pressing the A button the game will follow on normally. So you have to let the demo animation play in order to see the bug happening. Just make sure to use the Unibios v 3.1 set to "Japan" and "Console" because that is the setting that I was using. I've noticed that when using the default Europe bios (the first one that shows in the list) the bug won't happen. Perhaps the problem is with the bios??? I've tested the NGCD version of the game and it seems to run fine there. I've also noticed that if you visit the Neo-Geo bios select menu in the NG/NGCD options without a NG game loaded (that is, in a fresh run of the emulator with no bios set at all), the emu will hang if you use the up and down arrow keys to try to select a bios. Is this right? By the way, I've also noticed the bug that RamonZ reported about the GUI not showing in fullscreen mode. Sometimes his workaround of pressing the Esc key 3 times works, sometimes it doesn't. 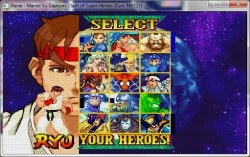 Therefore I have to exit fullscreen mode in order to select another game or set up the emulator in general. I really prefer to enter fullscreen when playing, so if maybe you could investigate what is causing this little issue I (actually we) would be more than thankful. I have Windows 7 SP1, GTX285 and nvidia drivers 341.92. Current version available for my card is 341.95, but I don't believe updating the drivers would fix this, because from the drivers' release notes the update is very minimal. That's it for now. Thank you so much for your time. Lol, still around after all this time ? Your save got me curious, but I can't check it, mega asks for a key to access the file and I don't have it ! For libretro I didn't know they had such a collection, the reply is yes probably, but now it's rarely easy. I guess the easiest solution would be to actually use libretro if possible, but even this could be complex. For your savegame it's probably something very stupid, if the emulator just vanishes (and doesn't crash), then it's a specific test which makes it go away, I'll have a look at least at that if I get this key ! Sorry, I didn't know Mega was asking for passcodes now. I've just attached the file to the post. Take a look! Now let's see if you can reproduce this weird bug. I'll try that! Thanks for the tip! Sorry I can't reproduce it, what I can tell though is that it's starting to play a new track just after these words, so if you customised your tracks it might be related. The track starting after this sentence is 43 (from the debug messages), see if you did something special with this track. Eventually just move your games.cfg somewhere else and load the game without one, which will make it run with completely default settings here. I used the emubios 3.1 + japan + console, so these are exactly the same conditions (except it's in linux and in debug mode), so it's very likely related to the tracks. Sorry I couldn't help more, I might look at the rest later. By the way it's not that mega asks for a key now, it was saying the file was encrypted and I needed this key to decode it, so you probably did something wrong when storing it there, anyway it doesn't matter now. Yes, the first time it happened to me I had all the tracks associated to external mp3 files. Then, to confirm it didn't have to do with the associations, I unzipped a fresh installation and played all the way up to this part with all default settings (except the unibios setup) and it happened again. The savestate that I provided is from the this new unzip, without any associations and customs settings. Please. see if you can test it in Windows and with a fresh install. Just use the Unibios because with the default Europe bios (the first from the list) it is curiously not crashing here. By the way, does the savestate store the bios selection information and its setup? PS: I need to say that to use the Kagura character in the ROM cartridge version of KOF 96 I used the Unibios cheat database. I don't know what you did with your setup, but I even tried in windows just now (using wine in linux, but it's the raine32.exe executable, the last one released). No problem at all using unibios 3.1 japan console + your save, can't do anything more here ! video setup, I guess you are using opengl right ? I guess I've found out what's happening. In order to trigger the bug you have to trigger a specific winning quote from Kyo in the winning/score count screen. The quote is "Stop moping around and butch up, you weenie!" How to trigger this quote? I don't know exactly. What I am doing is waiting the introduction movie play until you can see "Violent fighting to come again!" in the screen, then load the savestate. I did this for at least 3 times and could trigger the Kyo quote needed to reproduce the crash. If even with this you can't reproduce it, please see if you can have a quick try in a Windows installation because Wine may not be perfect for this specific testing. I have tried this in another machine with another intel processor and with integrated graphics and could easily reproduce it there (as long as I can trigger that winning quote). Thank you once again for you patience. Ok, reproduced and fixed. It's a very special place to find a speed hack, the pc gets negative if you read it on 4 bytes here (the 68000 reads it on 3 bytes), this is what creates the crash. You can work around it by simply disabling speed hacks in the neo options. I had a look at your freeze while selecting a bios without any neogeo.zip file in your rom directories, it's pretty obvious, but anyway I added some message for this kind of case. I think you'll agree it's not worth releasing a binary for that ! Anyway it's pushed to git. I might eventually have a look a this libretro one day, but weather is too warm for that now, so it might take some time ! I'm glad you could reproduce it. Thank you for fixing this one! Ok, no problem. If you could just find a way to convert these shaders to the format used in Raine it would be great already. By the way, I"ve turned off Double buffer in the OpenGL renderer options and now the GUI shows again in fullscreen! Why is double buffering causing this now? 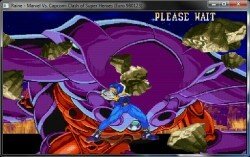 Finally, I'll leave here again some information about that Marvel vs Capcom graphics glitch which I had reported in the old forum. Perhaps you can check it some day. Thank you so much for your continuing work on Raine. Double buffer : it shouldn't happen, but it happens sometimes, a real bug in windows (but there is no such double buffer in linux), I never call the function to swap the buffers but sometimes when returning the gui it doesn't display the right buffer. To work around that in sdl2 they removed the double buffer in windows too by getting entirely rid of the 2d functions, everything is 3d now, with some hidden complexity, quite extreme, but it works. Anyway there is a fix for that for next version, it simply disables this double buffer when using opengl. And the famous cps2 game with display bugs : afaik it's the only cps2 game of this kind, it uses display interrupts to change the rendering and they are not emulated by raine (and it's the only game using this - with its clones). Add to that that I almost never played this game, maybe once or twice only, so motivation to do that is very low (it's complex to do, synchronize cycles from the cpu with refresh rate on screen... !). So it's unlikely for now that I'll ever fix this. I wanted to share my working Mac OS X compilation of revision v0.64.13. Thanks much for trying it out!! !